The World Head Injury Awareness Day falls on March 20th every year and it looks at the number of people who suffer from a mild bump on their head to severe brain injury. The purpose of this day is to remind us on how we could reduce accidents and brain injuries if we are mindful. Globally every year more than 5% of people get serious brain injury after they get into an accident or as a result of accidentally bumping their head. So this day is set to educate and make the world aware of how a minor injury to the brain can affect the quality of your life. 89 000 cases of new traumatic brain injuries are reported annually in South Africa. 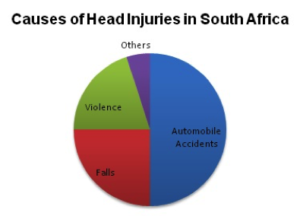 The three most common causes of Head Injury are: Motor Vehicle, Bicycle, Or Vehicle-Pedestrian Accidents (50%), Falls (25%), and Violence (20%). Head injury can result in damage to the most important part of the central nervous system, our brain. This can affect one’s health and well being adversely; even a very small case can result in eventual damage if the correct care and treatment is not received in time. Head injury can cause problems from loss of memory to severe paralysis and even death. There are a number of victims who are partially or fully paralyzed just because they did not wear their helmet on the day of injury. It is important to note that your skull doesn’t have to be crushed in order for brain damage to occur! There are a number of things which we all know can protect our head from injury but forget at times. Fastening helmets and seat belts while driving can help to reduce the cases of brain and head damage to a large extent. Wearing helmets whilst playing sport can also assist in reducing the chances of injury to your brain. Remember that if you spend one more moment being mindful of your surroundings you can avoid having to spend a lifetime living with disability due to head injury. If you come across an accident or need medical assistance call our emergency line on 0861 086 911 . LifeMed was established in 2006 with two ambulances and a vision of serving the community with the highest possible level of emergency medical care available. If you have any questions about any of our services, then feel free to contact our responsive support team.